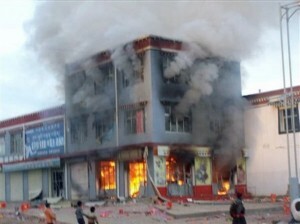 A shop burns during protest in Machu, Eastern Tibet's Kanlho prefecture, March 18, 2008. 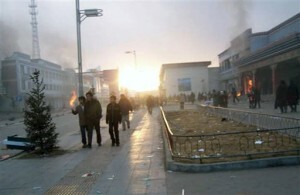 TibetanReview.net, 11 Feb 2011 | Two Tibetans, including a teenager, had been jailed in Kanlho (Chinese: Gannan) Prefecture of Gansu Province in November 2010 in connection with different incidents of protests against Chinese rule in Tibet, reported Oslo-based Voice of Tibet radio broadcast service on February 8th. It said Thupten Dhargye, 16, was given one and half years for staging a protest in Machu (Chinese: Maqu) County on 14 November 2010 with his friend Dorpel, 15. And Goshul Lobsang, 38, was jailed for 11 years on 26 November 2010 for his involvement in a 2008 protest in the prefecture. The report cited Dolkar Kyab, a Tibetan with contacts in the area, as saying Thupten and Dorpel had shouted for free Tibet and chanted “Long live His Holiness the Dalai Lama” before being arrested by Chinese police. Dorpel was not sentenced because he was in too weak a physical condition to stand trial after being tortured by police. He was handed over to his family without any information or explanation about his arrest. The prefectural court was reported to have tried and sentenced Thupten without any recourse to the legal procedure for dealing with juveniles. His parents were not allowed to meet him in jail or to be present at his trial. Goshul, father of a nine-year-old son, was reported to have been arrested on 10 September 2010 and sentenced by the same court. His family was reported to be poor.